Spring Fair 2020 will see the first major re-edit of the UK’s largest source of gift and home decor in the UK in 8 years. Following a year of planning by the organiser, the announcement comes ahead of this year’s Spring Fair run at Birmingham’s NEC, from 3-7 February. The exhibition, now in its 69th year, will have a renewed look-and-feel, which will reinvigorate the way buyers source products and connect with exhibitors. Celebrating both the Gifts and Home & Living sectors will remain a fundamental element of the show. Julie Driscoll, Spring & Autumn Fair’s new Managing Director, said: “This is a transformational moment for Spring Fair, and we are so excited to unveil the 2020 re-edit. Following our recent acquisition by ITE Group plc, we’ve invested heavily in both Spring and Autumn Fair, and this is just one indication of how that investment will deliver for both exhibitors and visitors. Spring Fair will continue to provide world-class content programmes that help the visitors and exhibitors differentiate, compete and succeed. Technological innovations, such as the recently launched Product Match app, will also remain a key feature of Spring Fair’s efforts to maximise opportunities for product inspiration throughout the show’s halls. Spring and Autumn Fair recently joined ITE Group plc as part of its acquisition of Ascential Events, and this re-edit forms part of the investment and renewed focus ITE set to bring to the well-established brands. 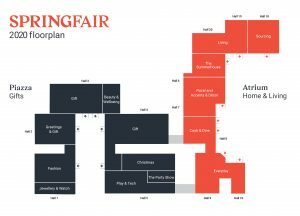 Spring Fair takes place at the NEC Birmingham, 3-7 February 2019. You can still register to attend for free here.